Today we’re going to talk about structural rack, which is one of the most popular style racks, just behind teardrop rack. Check out our video and transcription below. If you’re ready to select structural rack for your operation, visit our structural pallet rack page. Structural rack has a C-channel configuration. It’s very heavy duty, and it’s a lot more durable than a roll-formed style racking. Structural rack is very popular in the material handling and logistics industry. It is made for high-capacity, selective-type applications. Structural rack is also used in a lot of high density systems. If you have a drive-in system, a push-back system, or even a pallet flow system, nine times out of ten, they are made of structural style rack. Super durable, it comes in a three-inch column and a four-inch column upright for even higher capacity applications. 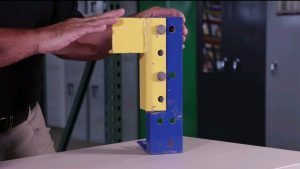 The main thing to remember about ordering structural rack, especially if you’re going to mix and match with other components that you already have, is the hole configuration. Each manufacturer can have different hole configurations. Usually they come in three-inch or four-inch center hole configurations, but you may see some manufacturers with the two-inch hole configuration. You’ll have different sized components to fit a 4-inch wide column versus a 3-inch wide column. Another thing that you may want to think about if you’re ordering beams to fit your your uprights or mix matching material, is the hole configuration also from the end of the column to the center of the hole horizontally. A lot of things come into play when ordering structural pallet rack. We carry thousands of uprights and tens of thousands of beams in stock at our facility at Warehouse1. We also order direct from the factory for specific applications. We’re happy to help you. Please contact us, and we can walk you through the entire process.